Chair for computer or office work. The survey resulted in four distinct customer segments, based on four different working situations: 1) the labourer’s chair, 2) the computer-workstation chair, 3) the manager’s chair, and 4) the 24-hour chair. The latter appeared to constitute a very limited market, and was not considered further in the study. The other 3 markets are shown in the figure below together with some parameters that describe them. 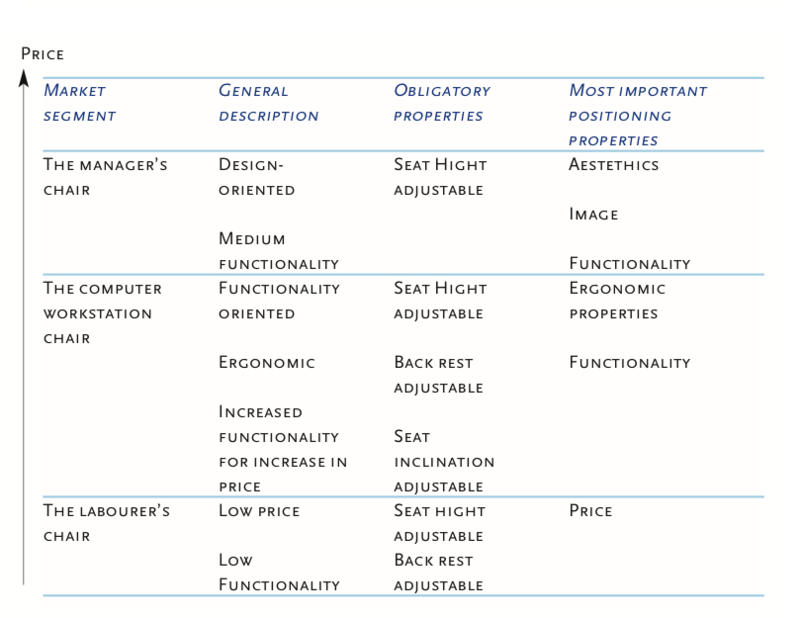 Figure: Segmentation of the Danish office chair market, primarily based on the type of working situation from Weidema et al. 2004. The study showed the labourer’s chair to be intended for the labourer, who is only sitting on the chair at intervals and for only few hours at a time, alternating with standing and/or walking working positions. The computer workstation chair is intended for the worker, who is primarily sitting, and who is working behind a computer, for a significant part of the day (at least two hours a day). The manager’s chair is intended for the design-oriented person. This person is not working much on computer, writing, or drawing, but rather reading or talking on the telephone. This chair could typically be for the employer or senior employee, to whom design, aesthetics, and representation to customers (image) are important issues. According to the study the office chair manufacturer reported little overlap between these groups of customers. This was in line with the findings of the market survey, which demonstrated that the chairs on the Danish market are targeted to each of the outlined customer types. Furthermore, the grouping was emphasised by the specific legislative requirements for seat inclination for the computer workstation chair. The standards for this type of chair were found to comprise both technical properties such as strength (e.g. ISO 7173), stability (e.g. ISO 7174-1), and safety (e.g. prEN 1335) and functional properties such as adjustments of seat height, depth and width, seat inclination, backrest height, width and inclination and arm rests length and width and more. The study showed that the probability that a chair targeted for one segment should sell to a customer in one of the other segments was small, so that the product substitutability from segment to segment can be neglected. In this case, a life cycle study of office chairs should consider each of the market segments separately and not allow for comparisons between them. This example is based on a small survey of the Danish office chair market (Weidema et al. 2004 and unpublished survey notes). The survey was based on marketing material from a number of suppliers, telephone interviews with both suppliers and purchasers and personal interviews with two leading manufacturers.